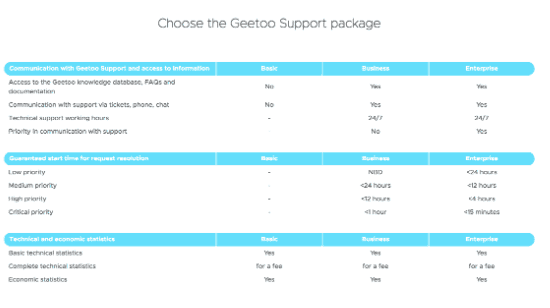 Geetoo Review 2019: Is Geetoo a Good Hosting? Geetoo is a long standing cloud hosting provider selling premium plans with a 99.99% uptime guarantee. You’ll need to pay extra for support, but the plans are fully scalable and you only pay for resources you use. Geetoo has been providing public cloud, private cloud, and advanced cloud technologies for developers since 2004. This is a Czech Republic based company with servers in multiple European data centers and a Czech website. Geetoo offers an extensive range of cloud and dedicated hosting services. Each cloud hosting plan features a comprehensive service availability SLA of 99.99% and professional branded components such as Hewlett Packard Enterprise or VMware. According to the website, the cloud is run in some of the safest data centers in Europe, which is quite vague. I can confirm the centers are Tier III, meaning less than 1.6 hours of downtime per year, and with data encryption, firewalls, and advanced virtualization software, amongst the technologies used, your data is safely stored. As the Geetoo Cloud is specifically designed for a large number of virtual servers and high volumes of data, it’s possible to increase or decrease the volume of data as you grow (of course, only paying for what you use). In other words, you’re not limited by the limitations of physical hardware. What’s more, via the self service portal, with a couple of clicks, you can add virtual servers, change the performance, check in to see which application is consuming the most data, view your technical statistics, and so on. As is often the case with premium cloud based services, the prices are not advertised on the website. However, with an uptime SLA of 99.99% and top of the line hardware, it’s safe to assume the prices will be at the higher end of the spectrum. The nice thing is that you can test drive the hosting with a free trial, although I wasn’t able to confirm for how long. However, there are some interesting aspects to Geetoo’s pricing model. First, all resources are consumed on a “pay as you go” basis, so you only ever pay for the resources you use. Further, you’re not tied in to a contract, so you cancel at anytime. And finally, there are no setup costs (which are often incurred with this type of hosting). Customer service is in Czech, with a focus on speed and customer satisfaction. That’s all pretty standard, but where Geetoo differs is its tiered levels of support. All kinds of support features, from access to help documents and communication via live chat to more important things like your SLA or your average response time to issues, are divided into Basic, Business, or Enterprise plans. I find it all quite confusing and it irritates me when providers charge customers for support, especially when it’s basic items like “technical support during working hours”, however, at least it’s all clearly laid out and there are no surprises. In my experience, I sent the team an email on a Thursday afternoon and did not receive a reply, despite waiting two days. Geetoo currently has servers co-located in U.K., Czech Republic, Poland, and Slovakia based data centers, with more coming soon in France, the Netherlands, and Germany. The plans have a 99.99% uptime SLA and fully scalable resources, but be prepared to pay for support. Wondering how Geetoo stacks up against other Web Hosting companies? Enter any other Web Hosting company and we will give you a side-by-side comparison.